Today continues our journey through the WWW 30 Day Challenge, jumping to Day 13 :: Make a neutral outfit interesting with statement shoes. This was an outfit born from the shoes up, which had just been plopped on my doorstep by the mailman as I was getting dressed. I suspected despite their neutral colors they'd be little showstoppers (I was right), and I wanted to play off of those colors in my outfit. Blazer, The Limited (almost exact match from Macy's). Top, ABS Allen Schwartz (similar). 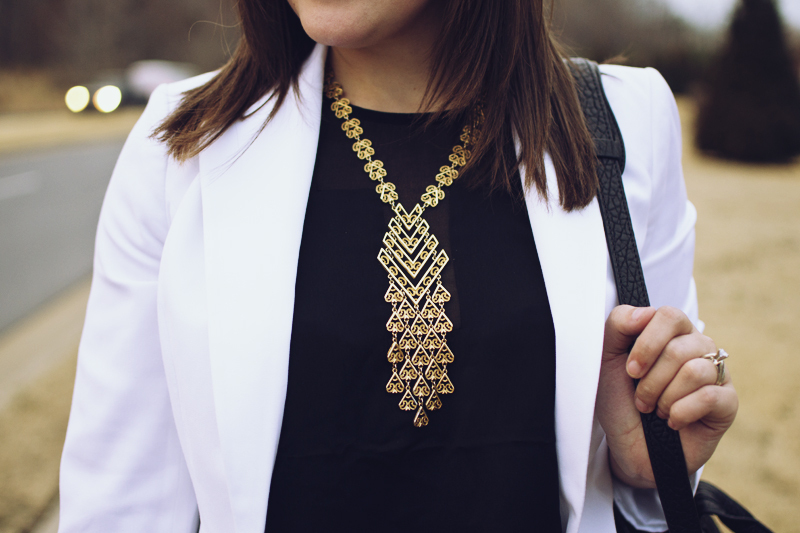 Necklace, Vintage (cool fringe-y similar piece from XXI).